10 pages were found with this tag. In this episode, Ricardo continues to talk about the "Global Reporting Initiative" and how one can report sustainability aspects in his/her projects and why this is relevant to the organization and to the society. In this episode, Ricardo talks about the "Global Reporting Initiative", an association that develops standards that help organizations of various sectors to identify and report what they do to build a more sustainable world, which goes beyond the environmental aspect. 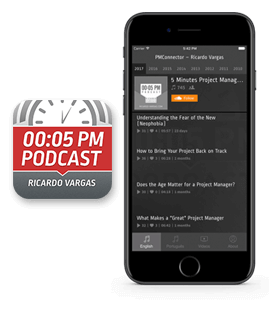 In this podcast, Ricardo talks about the knowledge of the various standards, frameworks and methodologies that project managers should have. He explains that the project manager must have the ability to understand a problem and solve it using various solutions for project management, making a mix and if necessary, create your own model. In this podcast Ricardo presents and highlights the importance of the standards which aims to facilitate the project communication process. It is the first of a two podcasts series about the subject where, besides talking about standards, Ricardo provides updated information about the ISO TC236 (Technical Commitee 236) that is developing the ISO 21500, which is fully dedicated to project management. In this podcast, Ricardo Vargas talks about the new edition of the PMBOK guide. He also talks about the main changes in the guide and explains that the PMBOK is aligned with the other PMI standards and using the same terminology. The publication's navigation is easy, fluent and direct. This podcast was recorded only in Brazilian Portuguese. The link below is for the Brazilian Portuguese version.